The main principle of a wood-fired oven is very simple. A wood fire is lit in the back, side or centre of the oven to heat up the inner dome and hearth area (mass). The oven will retain heat to create optimum cooking temperatures long after the flame is exhausted. An Authentic Oven is designed to retain its heat evenly between the temperatures of 300-400 Degree C for long periods. You can start cooking at any stage and the best way is to just try it! Its that easy. We have done the hard work now you can relax and enjoy. Your oven needs to heat quickly! The larger the oven the longer it will take to heat so in fact it may get used less than a smaller oven. Residential Authentic Ovens heat quickly and retain the heat perfectly for hours of enjoyment. Finding the right combination has only been achieved by experience. Keep in mind having enough space in the oven for your fire and multiple cooking trays. Our 750 oven is the smallest we recommend before things get too crammed but its heats quickly so you can use it whenever you feel like it. The 900 oven is larger, will take longer than the 750 to heat and will hold its heat longer. Heating times to peak temp vary with wood type, water content and also wind. Ready to cook, move your hot ashes to the sides and use the retaining heat to cook virtually anything. The use of tinfoil assists required cooking temps when cooking multiple items at one time. A well balanced oven is critical. This means when you place your pizza in the hot oven hearth surface it will cook both sides evenly. Authentic Oven’s are balanced to ensure even cooking over a variety of foods. Residential ovens are much different to commercial ovens, always use the correct design of oven for the job. Residential ovens are used in short bursts and heated from cold where commercial ovens are heated over the first week and mostly stay hot for their entire lifetime. You will find that most DIY online designs don’t take this into account and there is no real performance in mind when building one for the first time. Authentic Oven have built thousands of ovens and had years of experience and the opportunity to perfect our designs which has made us New Zealand’s prominent oven manufacturer. A fire is lit inside the brick oven with wood or in some cases gas. The heat generated by the source of energy used heats up the internal mass of the oven. The wood fired (or gas fired) brick oven is designed to retain heat and radiate it over an even cooking area. Heat must be even top and bottom of a pizza to cook properly. Your fire can be completely burnt out or ideally just hot ashes and embers left. Pizzas should be cooked directly on the hearth and roasts in cooking trays. The ideal hearth temperature for cooking pizza is around 350-425 degrees centigrade. The pizza dough should rise quickly but should not burst. Water content in your dough is important and relevant to the temperature of the oven. The best pizza ovens retain their even heat for long periods and don’t require much additional heating. To achieve the best cooking results you require products designed to RETAIN heat at required cooking temperatures…say 350 to 425 degrees centigrade on the hearth and surrounding dome. We call this ‘hover temperature’ (The period which the internal temperature stays the same or similar without adding additional energy for a period of time). The heat must be even under and on top of the pizza while cooking. Even density & mass also insulation. There is no text book to show you this……. 100’s of ovens later you may understand it like we do. Authentic Ovens have a long even hover temperature, which makes us stand out from the rest. An even heat throughout from a solid one piece hearth and fire brick dome. Each internal brick in the oven is adhered to each other making it one item so the heat is transferred evenly. The insulation is 100% ceramic fibre rated to 1670 Degree C.
To achieve this we use compressed high alumina fire bricks. Authentic Oven has invested large amounts of time and money on research to develop the correct hover temperature, by adjusting the levels of density to make long hover and adjusting the alumina content and thickness of each brick to adjust how quickly the heat is transferred. No kit-set product will achieve heat retention like this. Kit-set and cast ovens cannot achieve this as they do not have the quality and detail in their design. Authentic Ovens internal dome utilizes custom compressed fire bricks to achieve this effective formula. 2.5g/cm3 pressed and 42% alumina on EVERY OVEN. We are on a mission to be the world leaders in brick oven manufacturing and design by looks and performance. Different designs of wood ovens work better for different types of cooking so consider the type of cooking you would like to do. In essence the more density in the internal structure of the oven the more versatile it will be but the initial heating will take longer. Authentic Oven will design and manufacture residential or commercial ovens to suit your needs to perfection. We believe New Zealand made quality with high performance products is the right way to go. The defining difference between an Authentic Oven and our competitor’s ovens is the compressed high alumina fire brick used. Our ovens hold heat like no other product on the market. Many ovens are poured into molds with products with no alumina and no heat retaining properties. Authentic Ovens also contain 50mm of 100% ceramic fibre insulation surrounding the fire bricks and hearth creating an evenly heated cooking surface and baking oven. The insulation is so effective that while internal temperatures can reach 800 deg C, the outside cladding only reaches 55-75 deg c over several hours on continuous heating. Authentic wood fired ovens are made from the best products available. Absolutely no compromise in quality is our objective with over 2000 happy customers worldwide to date. 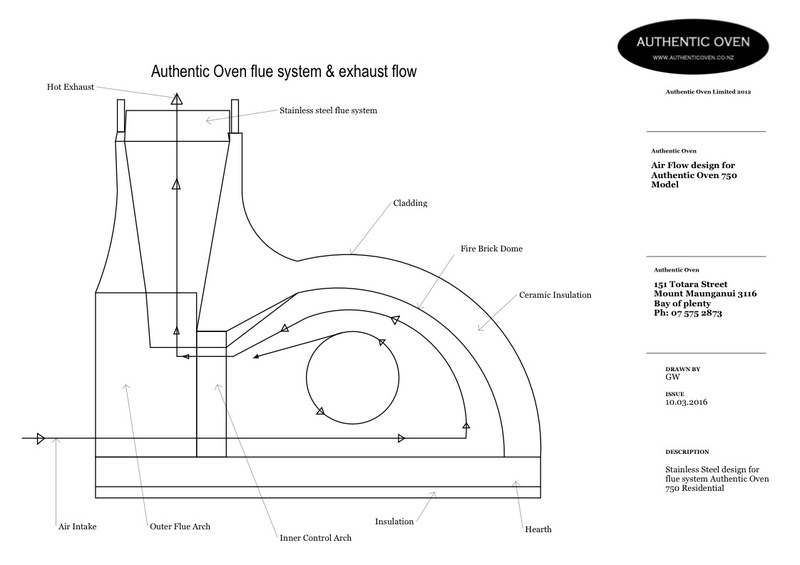 The Authentic Oven traditional external front flue system has been designed to work indoors and out. Perfectly sucking up smoke with minimal heat loss. Ovens with the flue system inside the dome area or back are simply not as effective at retaining heat as the heat escapes out the flue without transferring to the dome mass. See illustration above of correct flue system construction. Once your order has been placed, you are welcome to drop by the factory and see how your ovens construction is progressing. You will appreciate the work of art that is your Authentic Oven. Weekends please call for an appointment.